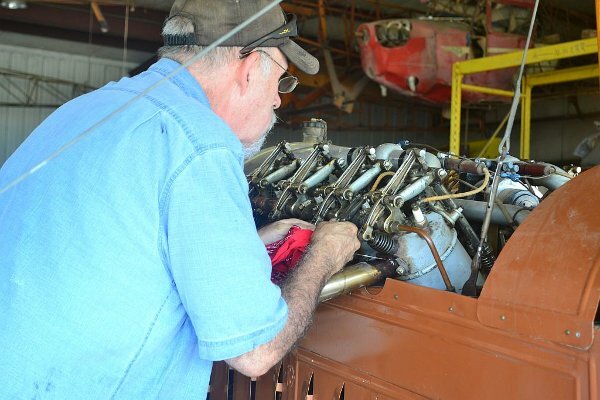 Terry Bledsoe led a team of volunteers in starting to prep the airfield for the upcoming Fall Fly-In event scheduled for Saturday, November 12th. We have problems with Mesquite trees and "Weesatch" shrubs (spelling? Whatever - it is a very thorny shrub!) growing on the landing strip so the group went out with loppers and plant killer to trim the shrubs off at ground level and douse them with the chemical plant killer. John and Johnny Bush, Billy Cheshire, Mark Halmark and Steve Richardson assisted Terry. The team treated about 35% of the landing strip, from the shop area to the north end of the runway. In addition, Richard Smith worked at the property's entrance clearing brush back to improve the appearance of the Museum's entrance. Richard singlehandedly cleared several loads of brush trash from the area! The initial issue with the Canuck this workday was the safety wiring on the turnbuckles and the tightness of the landing wires. Safety wiring the turnbuckles had started last workday, and Steve Freeman had continued safety wiring them throughout the week, but there are a LOT of turnbuckles in the Canuck's wings and there were quite a few that still needed to be wired. Dave Orloff, Dave Edgerly, John Goble and Steve Freeman started safety wiring turnbuckles, though Dave Orloff was soon diverted to manufacturing leather discs to serve as ant-chafing pads between rigging wires that cross over each other. Ultimately though, there are enough questions remaining about the rigging that they elected to leave the anti-chafing patches off for the moment. The rigging issue that remains is that the landing wires seem way too tight to most everyone! Rigging tautness was standardized well after the Canuck's time, so the stipulations about so many pounds of tension don't apply to this early bird. The Canuck / Jenny manuals don't give much more insight, simply saying that the landing wires need to be tighter than the flying wires, and don't over-tighten any wires! No quantitative data to work from. The problem seems to be that if the landing wires are loosened any the wings go out of spec in terms of dihedral, trueness, stagger, and incidence. Still, after everything was safety wired the intention was to fly the airplane and see whether anything needed adjustment - achieving the final product is an iterative process requiring several repetitions to zero in on the appropriate settings. So the Canuck was towed out to the end of the runway and attempts were made to start the old Curtiss OX-5. All to no avail. It appears that the exhaust valves in a couple of cylinders were stuck open, eliminating all compression in those cylinders. The Canuck was towed back up to the shop's pad and attempts were made to free the sticking valves. Marvel Mystery Oil was used, light tapping was tried, as was the old barnstormer's trick of feeding a little rope into the combustion chamber and turning the engine over, allowing the piston to apply pressure to close the valve without metal to metal contact. In one cylinder the rope got wrapped around the valve, causing a great deal of "discussion" before they freed the rope! These remedies worked on a cylinder or two, but at least one remains stubbornly stuck. The plan of attack is to consult with Phil Mentari about the stuck valves in the OX-5 as well as the rigging tautness. Phil is the OX-5 expert who recently helped us with the carb and water pump issues with the Canuck. 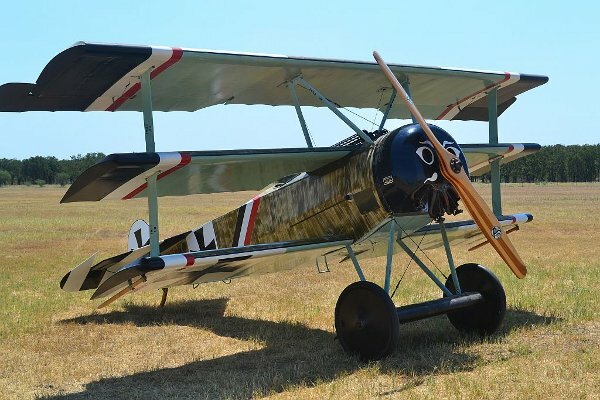 Also, Phil has recently completed a Curtiss JN-4D "Jenny", in US military colors, and hopes to sell the airplane in the near future after some test flights. We will store his airplane in the old hangar in the meantime. See Team Vehicles for a recap of those efforts. Thomas - Morse S4C "Scouts"
It was another "varnish-fest" for "Team Tommy". Tom Miller, Steve Richardson, Stefanie Miller and Dave Miller examined the work done to date on the turtledecks and belly forms for the two Thomas-Morse projects to identify missed spots / areas and then commenced to varnishing the parts needing it. Kevin Monahan worked on paint touch-ups on the main gear legs. Dave Miller located the spruce necessary for remaking all 4 longeron fascia pieces for Tommie 1. These pieces overlay the longerons and cover the metal fittings and bolts so the bolt heads won't rub through the fabric covering. Reliefs for two fascia strips were marked out in pencil by Tom Miller while Dave Miller located the forstner bits and started drilling out the first piece. The day ended with two fascia strips marked out and one partially drilled. Next visit should see the marking, drilling, fitting, installation and varnishing of these pieces. Jerry Stark and Steve Richardson worked to clean up T-1's joy stick assembly. They had considerable trouble getting to the blip switch! It took numerous attempts using lubricants, twisting, brute force and cussing trying to remove the handgrip! Finally they broke the grip free from the joy stick using a combination heat and long, homemade pins inserted down between the stick and rubber grip. With the grip out of the way they were confronted with an odd & mysterious switch mount in the end of the stick. I think the day ended with the blip switch still firmly installed in the end of the control column! However, we will need to remove the switch one way or another as the blip switch wires are seriously frayed and require replacing! It had been decided early on that the wood supports for the triangular engine cowl "cheek" panels would need replacing on T-1. It was also noted that the same components on T-2 were different. These parts are listed as "packing pieces" for the side cowling pieces (listed as "side plate assemblies). It was discovered that T-1's were made from spruce while T-2's were made from oak. Consulting the Replicraft drawings yielded no clue as to the type of wood used, however we noted dimensional differences between the drawings and both our planes! Given their purpose Team Tommy thought oak would be a wiser choice than spruce and that we should go with the thicker dimensions on the Replicraft drawings. The team sourced some oak wood from the pallet stack and ripped enough to remanufacture all the packing pieces for both airframes. Next visit these too should be finished and in place. Towards the end of the day Kevin Monahan and Steve Freeman started the process of reassembling the main gear for T-1. Apparently they reassembled the axle assemblies and stopped for the day. Ian and David Whitaker started their day off by tackling the throttle controls in the Triplane. Steve had reported that these controls were extremely stiff during his brief test flight. Their investigation revealed that the actuation rod from the quadrant in the cockpit was not properly aligned with the pivot mount in the engine bay - it was curving because of the misalignment. They adjusted the pivot mount's position and the throttle lever returned to normal feel; in addition, it operated the carb lever through a greater range of travel. We finally seemed to be getting full motion out of the system. The engine was ground run so Ron Marcotte could measure engine speed with a prop tach he'd borrowed from one of the R/C guys flying at the field that day! The engine turned up 1200 rpm out of a total possible 1300 rpm. Analysis of the slightly lower engine speed pointed towards a cylinder that may not have been firing. Inspection of the spark plug after removal revealed that the porcelain insulator was loose and rotating, so it needed replacement. Steve pointed the guys towards new plugs and they got installed. The engine was test run again and it seemed to be turning up full rpm and ran extremely well. Started on the first throw! The weather rolled in and it wasn't until later in the day that the Triplane's engine was run for an extended test run. Once again the engine started on the first swing and ran extremely well throughout all rpm ranges. Unfortunately the prop tach had left with Ron and the R/C guys so we don't know whether it is turning up the full 1300 rpm, but everyone is sure convinced it is! 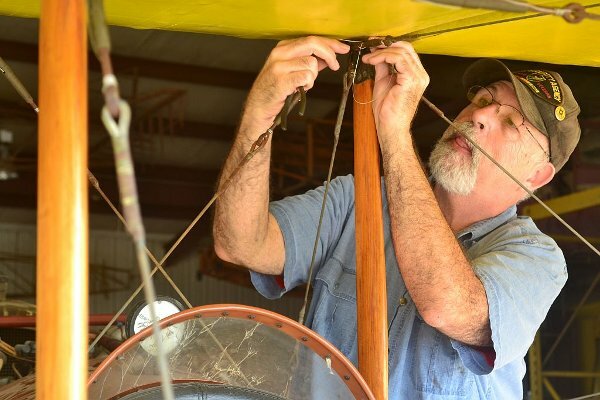 Ian thinks removing the carb and ensuring it is clean and clear may be the final tweak before the Triplane flies again. The need is under debate…. Ian and David say they have come up with the definitive Triplane starting procedure! In other words, they've stumbled upon the recipe all the old pilots know quite well!! Make sure the magneto switch is "Off"
Turn on the red fuel valve (handle to vertical) and open the fuel control lever fully and open the air valve lever fully. Wait for fuel to start leaking out of the carb - visible either through the starboard engine access hatch, or in the intake tubes. Engage magneto switch - Move to "ON"
Prop man swings the prop and when engine coughs to life on the prime turn the fuel valve back on immediately. Ian reports that with this sequence the engine has fired up on the first throw each time! In his spare time Kevin Monahan brought the 1921 Triumph motorcycle out of the old hangar and adjusted the drive belt tension. I don't know for sure, but I'm sure he succeeded! Cameron Whitaker installed a Holley NH carb on the American Ambulance. Cameron obtained the carb for free as it was trashed, he repaired various parts and replaced others from the Museum's spares, resulting in a $10 carb! The $10 was for a special nut at the bottom of the float bowl - the only part that needed to be purchased! Cameron reports that the American Ambulance now starts and idles easily, running perfectly under load. Cameron then installed a set of stock-style pistons in the TT with David Whitaker's help - removing the shot hi-compression pistons that had been giving trouble. The new head gasket failed to seal well when the motor was initially started after the piston swap, spewing water everywhere! Cameron and David disassembled the head and addressed head gasket leaks. The engine remained hard to start - but finally the carb was adjusted so the engine would run, but in the process it was discovered that the carb needs to be rebuilt. Cameron took it home to refurbish it. Already the vehicle is burning a lot less oil than it was and with the refurbished carb installed should run even better as the rings bed in. Other Team Vehicles guys attended the workday, Al Sumrall, Lynn Howell (and Killer), and John and Johnny Bush. Lynn Howell and John Bush coaxed the Nash Quad to life for its move. 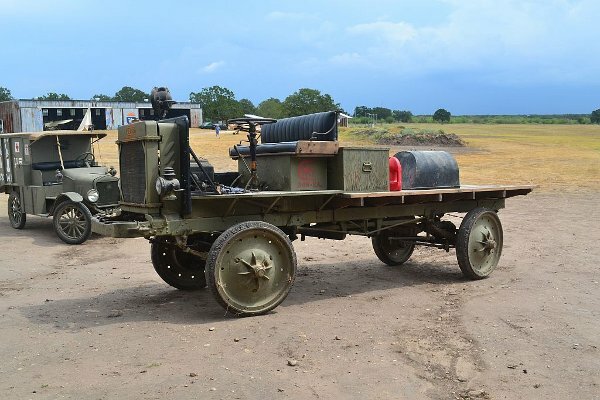 Many of Team Vehicles guys swarmed all over the ditch digger to get it started and moved - David Whitaker finally located a safety plug under the seat that had become disconnected and that tool was started and relocated under its own power. An additional three Model T vehicles were moved as well and the old Zeppelin ladder was moved out of the old hangar. Team Vehicles put in a lot of effort to clean up the old hangar as various vehicles were moved, and then spent a lot of time helping Steve Freeman and Terry Bledsoe move airplanes around (similar to rearranging furniture for your wife… "No, I think that really belongs back over there!") to verify there would be sufficient room for Phil's Jenny. Killer set a new world's record for the number of tennis balls chased and fetched! During the afternoon Team Vehicles was treated to some music from an ancient (1908) gramophone that the Whitakers own - a family heirloom. Cameron has rebuilt the mechanicals on the thing and it works beautifully now! Next thing you know Cameron will turn the gramophone into a motorized bicycle - it will serenade the crowd as it powers itself along! No doubts though - an awesome accomplishment…. Curtiss JN-4D - New Resident - Phil Mentari has been looking for a new spot to park a recently completed Curtiss JN-4D for a test flight or two, then sale. The Museum has elected to accommodate Phil's Jenny till he sells it. That necessitated making some space in the old hangar which dictated much of Team Vehicle's day! It took a lot of hard work, generally directed by Terry, to clear out the old hangar and muscle a lot of the stuff over to its new temporary home! Job well done guys! Not sure when Phil's Jenny will show up, but at least we know we have room for it!! The airfield was visited by Cindy Weigand - a published aviation author, she has published a book on WWII Wasps who were from Texas. Her uncle was a barnstormer named "Big" Jack Ashcraft. Jack flew with a large barnstorming group all over the country, and Jack's usual job was flying the wing walker. Cindy had some fascinating stories and photos of her uncle. Cindy checked out the Triplane, a Model T ambulance, and the Bleriot. I think she had fun…. Lastly, the best part! John and Linda Goble showed up with a container full of homemade chocolate chip cookies! The cookies were absolutely wonderful and barely made it to lunchtime!! Thank you, Linda! That was it for this workday - see y'all in October!